We’re back with more stories! In case you missed it, the adorably amazing Christine Hennebury and I have been playing a game that we’ve recently opened up for anyone who wants to play along. Each week, I take or choose a photo and share it with the players, each of whom use it to craft a piece of flash fiction. We’ve moved to a bi-weekly schedule to accommodate the madness of June and what I hope will be a lazy summer break. I like how this week inspired a lot of the players to riff on the theme of relationships, and quirky ones at that! He picked up her knitting that she had left on the porch and moved to the rocking chair. Holding her last project in his lap, he looked out across the veranda, his mind drifted to the past, to the images of her working the garden, her apron filled with the bounty she collected for the soup pot. With it came the memory of scent, of the aromatics cooking in the morning’s bacon renderings. Chubs, their skinny marmalade barn cat, rubbed up against his legs, bringing him back to the present. “Woman! Get me a beer!” he shouted over his shoulder. And that was the last thing he remembered. The rocker was moving. By itself. Again. He looked over. Just the wind. A strong breeze making its way around the house, finding the objects that could be moved, leaving those to heavy for its ephemeral power. But it was pleasant to imagine otherwise. That had been her rocker, as this was had been, and still was, his. It hurt to sit there alone. But it was also necessary. He needed to experience the pain, over and over, like a tongue poking at a gapped tooth’s absence, like a teenager, cutting herself to feel the pain as familiar. He sat because if he was going to be reminded she wasn’t alive anymore, he might as well dive into her absence, to drown himself in the pain that her death had brought. 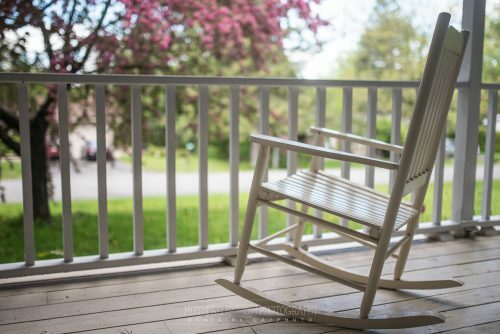 One man, sitting on a porch, with an empty rocker rocking. Out of balance and asymmetrical, like the rest of his life since the day he’d come back from the hospice with a large paper bag full of her few personal items. The rocker rocked. It was a beautiful day, and the wind coming around the house cut the heat of the sun nicely, vinegar to the sun’s sweetness. And then he heard the wind whisper his name. Want to get in on the game? Write your story and leave it in the comments, or leave a comment and I’ll add you to the list!